PRO: Who can resist a guilty pleasure? At face value, reality television is easily a reflection of everything that is wrong with society. The only thing worse than the housewives, bachelors, idols, kids from the shore, teen moms and toddlers, might just be those who tune in to watch these shows every week, fuelling our society’s great appetite for idiotism and humiliation. So why is reality television this irrevocably addictive? Reality T.V. is life at the extreme; it’s indulgent and candid. It is the quintessential guilty pleasure that networks like TLC and MTV capitalize on because the truth is, reality T.V. is the staple entertainment of the 21st century as it makes us go from viewers to voyeurs. Shows like Survivor, Big Brother, Real Housewives and The Bachelor give viewers the spectacle of drama different from any other television program. The fact that these characters are not fictional makes it gripping on an intrinsic level, exposing human nature at its extreme. Ancient Greek philosopher Aristotle mulled this idea over for years, saying that the Athenians who attended the theatre did so as a way “to be cured, relieved, restored to psychic health,” he wrote. After a long day of ordinary responsibilities and relationships, reality television is the perfect antidote. It is a form of catharsis that allows viewers to purge various emotions and exposes our very own excessive passions we sometimes keep withdrawn. The representation of real people in real situations makes the “what would I do?” question more plausible. We root for the underdogs and the stories that pull at our heartstrings, but we revel in the drama, the fights and the humiliation. Many baby boomers cannot seem to understand the beauty behind reality television shows, and why would they? Classic sitcoms they grew up with like All in the Family, Three’s Company and The Mary Tyler Moore Show were wholesome, family-oriented shows. Censorship was more prominent; people were not as open and candid. However, nowadays we live in an information age. The more we know and the faster we are updated, the better. Not only is reality T.V. entertaining, but it sends the message that ordinary people can become so important that millions will watch them and talk about them to friends and coworkers. People always bring up the falsehoods of reality T.V. and it being detrimental to society due to fabricated situations, pre-scripted events and various ethical issues. However, reality T.V. continues to win the popular vote as ratings for shows like American Idol and The Voice remain high time and time again. Aside from the regular “trashy” programs, shows like ABC’s Supernanny, A&E’s Intervention and NBC’s Biggest Loser can actually be really helpful to an audience’s larger consciousness and provide beneficial information. Blaming reality T.V. for our societal problems is just our way of dismissing the other reasons for our so-called “dumbed-down” popular culture. I’m pretty sure it’s not just the Kardashians corrupting and influencing the youth, however hard they might try. From The Jersey Shore to Here Comes Honey Boo Boo, reality television seems to have taken up a large part of network airtime and everyday conversation. But the question is, why? In a less obvious way, reality T.V. makes the far-fetched lives of the rich into something attainable and even more so, expected. The picture perfect girls on The Hills live in beautiful apartments in downtown L.A., drive nice cars, and have internships with companies such as Teen Vogue. Viewers, noticing that these characters aren’t anything above ordinary in regards to intelligence or wit, may start to wonder why their lives haven’t panned out the same way. It’s mainly because the girls on The Hills are filthy rich. Not only do these types of shows damage the viewer’s mind, but also the minds of the ‘actors’ or participants in the shows. Reality T.V. is like any other dramatized television show except that it “blurs the line between actor and person,” said Laura Buchanan, a student studying theatre performance. 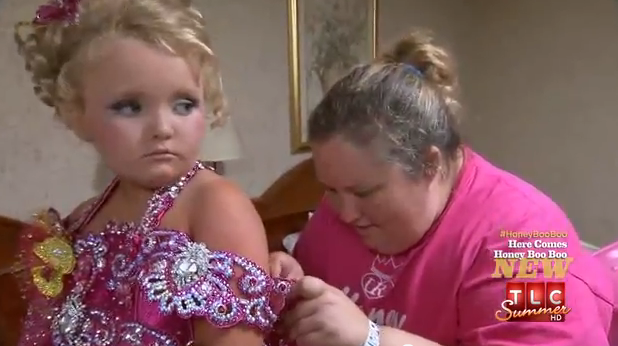 Toddlers in Tiaras teaches children at a young age that aesthetics, physical beauty, and a slightly crazed mother will get you what you want. This is a recipe for disaster. Starring in one of these absurd shows means living with the fear that if you don’t act ridiculous every episode, you’re going to be quickly replaced. Characters on Laguna Beach or The Hills who don’t invoke as much attention as the networks would like, gradually fade away until they don’t appear in anymore episodes. “There is a reason people watch T.V., and it’s not to watch ordinary people’s lives,” said Kenna Prepchuk, a political science student at Concordia. The people on these shows ruin their future dignity in the sense that no one can ever look at them the same way. Unless these actors have signed a contract to do the show for life, how can they expect to be recognized as a person who can be hired for any other job? The networks aren’t solely to blame in this situation because just like any business, they are there to make money and will do anything to get it. Making profit from reality T.V. shows like Jersey Shore means including highlights of excessive drama and cutting out the mundane and the ordinary. While reality T.V. lacks style and class, like any form of addiction, knowing its bad for you doesn’t mean you’ll quit it anytime soon.